The final mural is complete. 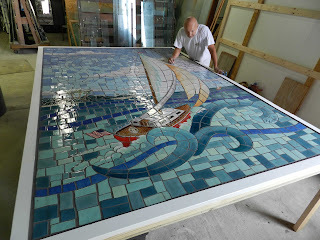 We finished the setting and grouting on 10-27-11. Believe it or not we are 4 days ahead of skedule. What a great project!! Now we wait till the bridge gets painted. The painting is underway. it will be a bluish grey. The murals should really stand out. The tenative date for the installation is the first week in December. I will be there watching.